2018 vintage is set to be labeled an amazing vintage, with superb conditions and fruit of outstanding quality being harvested. The Winter and Spring rainfall leading into the 2018 season was excellent at 20% above long-term averages, soil moisture was replenished, and aquifers recharged. Winter was cold delivering a good dormancy. An unusual single black frost on the 4th November, damaged vines throughout the Limestone Coast, and reduced yields in some of the northern vineyards of Coonawarra. October through December was two degrees warmer than average, but without peak temperatures causing and issues this advanced flowering by three days (24th November, 80% capfall) compared to regional long-term phenology. The flowering to fruit set period was quick, assisting in good berry numbers. The berry development and ripening period from December to mid-April was very dry, delivering only 50mm, which is half the normal rainfall. Consequently, there was no disease pressure. The warm Summer temperatures advanced veraison by two weeks, to the end of January then a strong “Bonney“ coastal upwelling cooled March, and extended the ripening period such that Cabernet was harvested in line with long term harvest dates (early April) predominantly from the last week of March through the first two weeks of April. The yields were moderate, and the slow cool ripening was very even, delivering fruit with fine tannins and strong varietal flavours. Cabernet Sauvignon – deep dark colour with intense fruit character and soft ripe tannins. Shiraz – deep colour and rich ripe fruit with excellent structure. Whites – showing good balance. This is great news as the demand for fruit in the region is high, particularly in Cabernet – the variety that makes up 65% of the regions plantings. A cool growing season and above average winter rains leading into the 2017 vintage saw the region return to what could be best described as a more traditional Coonawarra vintage. The cooler conditions resulted in budburst being delayed by up to three weeks, with flowering two weeks later. A mild Summer followed, with a welcome spell of hot days in late January. These factors saw harvest commence towards the end of March and continue through to early May. Coonawarra has not had a vintage which commenced this late since the outstanding 2004 vintage. The major concern was the highly variable weather which can occur at this time of year. The start of vintage saw white grapes with good varietal definition and the reds, albeit at lower sugar levels than recent vintages showing excellent colour and concentrated fruit flavours. April saw a large rain event toward the end of the month, and this, combined with above average yields meant that not all fruit in Coonawarra was harvested. With Growers and wine makers working together to obtain solid results in Cabernet Sauvignon, Merlot, and Chardonnay, Shiraz being the one variety that was difficult to finesse. With the integrity and reputation of Coonawarra of upmost importance, it was pleasing that grape growers and winemakers alike refused to pick fruit of inferior quality, and with this in mind it is anticipated that yield for the region will be similar to previous years. Reports of good quality wines in tanks around the area are common, with winemakers being impressed with the fruitiness of the whites, the deep colour, and elegant fruit flavours of the medium bodied reds. Vintage 2016 was early, with a warmer October advancing the whole season, such that flowering, veraison (start of ripening), and harvest dates were all a couple of weeks early. Despite the early season, the time taken for berry development and ripening were in line with normal, allowing adequate time for fruit to develop tannins and complexity. November temperatures were warm which was ideal, as there were good flower numbers, and consequently grape numbers per bunch were above average, and of even maturity. Yields were an increase on some previous years, but not excessive when managed appropriately. A cold ‘Bonney Upwelling’ at the coast moderated temperatures from January onwards. February and March temperatures were mild, and the cold nights and warm days delivered an extended ripening period, and very promising fruit across all varieties. Winter rains have been reducing over recent seasons and as a result, end of winter rainfall levels were below average, but adequate for soil profiles pre budburst. The growing season (September to March) was very dry, delivering only half the normal rainfall. Coonawarra’s vignerons have been refining irrigation strategies to optimise use of the groundwater, and careful irrigation has been integral to maintaining leaf function and delivering varietal flavours for the region’s wine makers. Whites have good natural acidities this year, and show a lot of freshness and tang , with fine fruit flavours. The reds all have outstanding colour and tannins facilitated by a very even veraison, small berry size, and milder ripening conditions later in vintage. The cooler finish allowed longer hang time contributing to rich medium bodied Cabernet and Shiraz wines with good fruit definition. Another very good vintage in a run of good vintages since 2012. The growing season was drier than average, and careful irrigation to optimise flavour development worked very well. Harvest was two weeks early, the result of a warmer than average October which advanced the whole season. There was a cooler finish with mild ripening conditions. The Cabernet Sauvignon and Shiraz have full palate richness whilst being medium bodied with fine tannins and excellent colour. From a seasonal point of view, April to July 2014 provided an excellent start with average winter rainfall which set us up for an even budburst with good soil moisture. Spring however was not typical, being very dry and one of Coonawarra’s warmest, with temperatures well above average advancing flowering in November by about 2 weeks. Fortunately the warm and dry flowering promoted a fast and even berry set, similar to other excellent seasons, for example: 2001, 2004 and 2010. This warm flowering provided even maturity at harvest with no green berries. Yields overall were on the moderate side due to lower bunch numbers, and as a result little bunch thinning was required at veraison, and many of the vineyards were naturally very balanced in terms of their fruit to leaf growth. Very dry conditions continued through December, consequently berries remained small with thick skins. Ripening was set up perfectly with the vines receiving a refreshing drink of 90 mm of rain in mid-January. Coonawarra’s summer, in contrast to the spring, has been a classic, with warm days and cool nights, strongly influenced by the January upwelling of the deep, cold coastal waters….around 5 degrees colder than those off Adelaide. This has provided a long and cool ripening, ideal for Cabernet Sauvignon, which was harvested at normal time ie – late March early April. This is surprising to many who have seen the very early vintage in the rest of the state. Based on the mild summer, and consequently long ripening period, we have made elegant Shiraz and strong Cabernet. Pleasingly, we are seeing bright fruit, varietal definition and intense colour at moderate sugar. 2015 is a strong tannin vintage which at this early stage, will translate into wines that have excellent cellaring potential. Season 2014 in Coonawarra will be described by most as one of the longest on record starting Mid February and finishing in the first week of May. The season started with the winter season which was the second wettest in the last 28 years providing a very welcome recharge to the underground aquifer. Spring in Coonawarra saw the rainfall continue with almost double the long term average falling, a blessing in disguise with the warm weather that was to follow during summer. Flowering from late November to mid-December was cold and windy, similar to vintages 2009 and 2012, and consequently fruit set was impacted. Cabernet was the variety most affected and has more moderate yields as a result. January and early February were hot and dry, however with good water availability and accurate early weather forecasts the fruit was well protected by healthy canopies and heat damage to the vines and fruit was minimal. The warm weather brought the ripening of many of the varieties on rapidly. But the cool nights and moderate days that the Coonawarra region is famous for soon rolled in around mid to late February, to preserve the acid and flavour of the whites. The reds, especially Cabernet have benefited significantly from the cool slow ripening period. Leaf condition held well for most of the season with autumnal yellowing of older leaves starting early April and some very cool nights at the start of May finishing leaf drop. The region was also blessed to have only received small falls of rain over this period meaning fruit quality has been very sound right to the end. Winemakers are excited by initial assessments of Cabernet and Shiraz wine quality from the region. The flavours seen in the field have translated well to the progressing wines. Overall, a perfect extended dry and mild ripening season for flavour, colour and tannin development which will deliver a classic Coonawarra vintage. Coonawarra has experienced an excellent vintage which was characterised by a warm, dry summer and then a cool autumn. After a warm, fast flowering period, we saw an even set with high berry numbers per bunch. The excellent set necessitated significant fruit thinning at veraison which was advanced by approximately a week by the warmer weather. However, a late “Indian summer” afforded winemakers the opportunity to steadily pick the grapes without the pressure of an early season break. These conditions have been optimal for our reds (primarily Cabernet and Shiraz). As a result there are strong wines with high colour density, fruit concentration and tannin structure. The 2012 Coonawarra Vintage is described as “excellent” by all winemakers. Good winter rains resulted in a full soil moisture profile leading to ample vine carbohydrate reserves. These optimal growing conditions, combined with an early burst of warm weather, meant the vines started their growing cycle a couple of weeks early. The lack of frost and small but frequent rains maintained the early season. Flowering commenced in late October with mild but windy conditions leading to a slightly poorer set than in the previous couple of years. Coupled with above average temperatures from November to January, berries were smaller than average further contributing to lower yields in most varieties. Veraison commenced in late January – two weeks earlier than average. Cabernet, Shiraz and Merlot did lag a little, but quickly caught up once a warmer spell arrived in January. January was also very dry (3mm total) for the month. The dryer than normal conditions progressed into February, leading to a very rapid accumulation of sugars in the berries. Harvest began in early February on the whites (again about two weeks ahead of average), with favourable sugar and acid ratios. As the reds started to reach between 10 to 12 Baume, a period of very cool nights and mild but warm days set in which served to effectively slow the ripening process. The grapes had time to reach optimum phonological maturity. Seed hardness coincided with sugar and flavour levels. Good natural acidity levels are a clear attribute of vintage 2012. Supple tannins are evident already in reds. Overall, 2012 grape tonnages were below average but quality is very pleasing. Sauvignon Blanc, Riesling and Chardonnay have all been positively received by Coonawarra winemakers. Crisp acidity and good varietal definition is well noted. 2012 Coonawarra Reds are very strong. Shiraz shows classic red fruits with hints of spice – medium bodied and fresh. Cabernet Sauvignon is highly coloured, concentrated and varietal. This promises to be a vintage to collect. There was very little uncontracted fruit in Coonawarra in 2012. Furthermore, there was strong demand for what was available. Strengthening markets in Asia (particularly China) ensured good demand for quality fruit. History will note the 2011 vintage as one of mixed fortunes. Elegant, varietal whites and a mixed offering of reds are the results. Above average rainfall during winter, and colder spring soil temperatures contributed to a slow bud burst, delivering shorter shoot growth up to flowering in November. Several rainfall events over the November/December period proved challenging to viticulturist, with healthy vine canopies and some mildew control, the primary focus. Fruit set was relatively even in all varieties and with diligent disease management and strategic crop manipulation, many parcels of fruit, exhibiting good varietal characters, at lower maturity and alcohol levels have been picked. Promising wines are expected from our key white varieties, with Chardonnay expected to be the leading light. Good leaf fruit ratios and slow ripening conditions have contributed to ideal flavour development of these wines. Cabernet Sauvignon, once again, has with-stood the difficult season, with early harvested fruit exhibiting key Cabernet characteristics at much lower Baume (sugar levels) than in recent vintages. All in all, the 2011 vintage produced smaller volumes of medium bodied, traditional wines. The 2010 vintage shows great promise, largely due to above average soil moisture levels, ideal growing conditions, minimal disease issues and above average summer temperatures prior to vintage. Due to this increase in temperature, ripening was accelerated and most wineries began picking earlier than usual – many of them in early to mid February. Winter rainfall in 2009 was above average giving good soil moisture levels for budburst in early spring. Favourable conditions continued during spring with minimal frost and settled flowering conditions allowing for excellent vine canopy development and fruit set. During November, much of South Australia experienced a protracted ‘hot spell’ however most vineyards were spared from damage as bunch development was still at an early stage. Strategic crop manipulation and reduction was wide spread across the district to ensure fruit development was optimum, especially in Shiraz and Merlot varieties. Harvest began approximately 10 days earlier than usual, commencing with white varieties. Flavours have been of a high standard showing vibrant varietal distinction, particularly Riesling and Sauvignon Blanc; however yields have been generally below average. With a return to more stable weather patterns during January and February our key varieties, being Cabernet Sauvignon and Shiraz, exhibit the benefit of slow maturity, ripe seeds, and rich tannins. The early ‘break’ to the season provided a freshening of the fruit and ensured all parcels were harvested by the 1st week in May. Wines showing great promise with intense varietal characters, deep colours and soft tannins have resulted from the 2009 vintage, which commenced later than recent vintages, as a consequence of close to average temperatures during the growing season. Winter rainfall in 2008 was average giving good soil moisture levels for budburst in early spring. Conditions during spring were dry with minimal frost and no disease pressures allowing for excellent vine canopy development. Prolonged flowering due to cloud and wind during November caused a noticeable decrease in fruit set in Cabernet and a corresponding drop in cropping levels. The vines resilience was tested in January with four consecutive days of record hot temperatures, however, the healthy canopies shielded most varieties from any major damage. Vintage temperatures were slightly below average providing a long slow ripening period for the reds. The harvest started in mid March and did not finish until early May, with winemakers keen to allow the grapes to hang on the vines to optimise colour, flavour and tannin development. The white wines are showing excellent flavour profiles at lower alcohols. The reds are characterised by deep rich colours with Cabernet Sauvignon exhibiting good structure and varietal character and Shiraz showing rich peppery aromas and flavours. While the Merlots are exhibiting deep broody aromas and full body this season. Excellent seasonal growing conditions and a dry summer saw an early start to vintage in 2008 with vines showing little effect from the previous year’s frost. Despite a dry winter, early spring rains resulted in excellent budburst and enhanced vine health and fruit development. The dry conditions throughout the growing season resulted in low disease pressure. White varieties benefited greatly from the cool February temperatures developing intense fruit characters and displaying good varietal definition with the majority of whites harvested prior to the hot conditions in March. The extreme March heat hastened fruit maturity across all red varieties with flavour, baume and colour accumulating rapidly, compressing vintage and causing some logistical challenges. Most reds were picked between late March and early April producing intense wines with great colour, rich ripe flavour and fine tannins. Yields were slightly below average for Cabernet Sauvignon with the wine’s showing excellent colour, good varietal distinction and ripeness, with flavours of attractive mint and mulberry. Shiraz yields were close to average and also show good ripe flavours with liquorice and spice. Despite some challenges current indications are that we can expect many exciting wines from the 2008 vintage. Warm and dry ripening conditions resulted in the 2007 vintage producing good fruit quality, however the yields across all varieties were well below average. It was a difficult growing season with severe spring frosts (which affected 60% of the region), coupled with unusually dry spring and summer conditions. A drenching rainfall in early January revitalised the vines, restoring soil moisture which allowed the vines to develop flavour and colour in the grapes. All white varieties are showing a good balance of acid and fruit with elegant fruit characters particularly Sauvignon Blanc which enjoyed the benefit of cool nights and warm days in the lead up to harvest displaying distinct varietal flavours and characteristics. Although flowering and set was slightly uneven, berry size remained small, and combined with the dry conditions, the red varieties matured the grapes with no disease pressures. Cabernet Sauvignon with strong flavour and spicy tannins is particularly pleasing. Merlot enjoyed the seasonal conditions and ripened beautifully with soft varietal expression and exceptional colour. Shiraz with flavour ripeness developed generous rich fruit. A low yielding vintage, with warm ripening conditions, resulted in good quality, clean fruit showing intense fruit characters with the potential for admirable quality wines. 2006 was another excellent vintage for Coonawarra with great consistency across all varieties. A late autumn break was followed by a warm spring resulting in early budburst, flowering, veraison and harvest. Small berry size produced below average yields but heightened the intense fruit characters and flavours combined with ripe soft tannins. 2006 will be a year remembered as slightly earlier than the long term average compact and trouble-free. Average winter rainfall and warm spring conditions resulted in an early bud burst and excellent shoot growth. The frost season was uneventful due to an earlier flowering however cooler conditions towards the end of flowering did inhibit fruit set in some vineyards. A warm to hot summer with favourable rainfall events throughout encouraged steady vine growth and balance, resulting in early ripening. Disease conditions were kept minimal with little impact. Chardonnay, Riesling and Sauvignon Blanc continue to do extremely well in Coonawarra with wines showing excellent varietal fruit characters. Cabernet Sauvignon was of exceptional quality with Ph and acidity balance near ideal. Merlot enjoyed the seasonal conditions and the modest cropping levels resulted in soft perfume flavours, excellent structure, generous ripe tannins, albeit with slightly higher alcohols than normally expected. Shiraz also enjoyed the seasonal conditions with generous ripe tannins underlying spicy elements that are achieved in high quality fruit. A very pleasing vintage with deep colours and great varietal intensity. Coonawarra Vignerons are pleased to report that 2005 was a very good vintage with warm dry conditions during March and April concluding the favourable conditions experienced throughout the growing season. The early start to vintage delivered some terrific flavours in the white varieties and this trend was maintained for the red wines with all varieties considered as very good to exceptional. The 2005 vintage will be remembered as comparatively compact with average to slightly below average yields and warm dry conditions throughout, making for trouble-free harvest management. The early vintage can be traced back to the start of the season with early bud burst and excellent shoot growth resulting from a wet winter and fine spring conditions. Flowering was also a little earlier and the weather was favourable for the most part but cooler conditions towards the end of flowering did inhibit fruit set in some vineyards. Late spring and summer can at best be called normal, with mild conditions experienced throughout the growing season but with a noticeable absence of periods of hot weather. This, along with the very dry summer and autumn, provided for a near ideal season in which the vines were comfortably able to ripen their fruit. Chardonnay, Riesling and Sauvignon Blanc all benefited from the mild summer and the majority of fruit was picked with high acid, lovely mineral elements and slightly austere fruit characters. Winemakers are particularly pleased with Cabernet Sauvignon, Merlot, Petit Verdot and Cabernet Franc, all of which have good varietal characteristics and structure with a rich ripe flavour profile and generous ripe tannins, albeit with higher alcohols that normally expected. Shiraz also enjoyed the warm dry autumn conditions allowing Winemakers to pursue fruit characters in the riper spectrum with generous flavours and structure. In summary, a very pleasing year. An ideal growing season leading into the 2004 vintage, combined with the maturation of new plantings, has resulted in an anticipated record vintage for the Coonawarra wine region. Although it has been one of the latest vintages on record, the regions winemakers are particularly pleased with the quality of Cabernet Sauvignon and Merlot wines, and there is widespread satisfaction with white wines, in particular Riesling and Chardonnay. The winter and spring conditions of 2003 were considered average in terms of temperature and rainfall, although budburst occurred slightly later than normal. Warmer weather in late spring and early summer ensued, producing ideal flowering conditions. Characterised as short, sharp and even, the excellent flowering period achieved almost 100% fruit set, and all indications pointed to above average crop levels in all varieties. Very cool and dry conditions during January accounted for the delay in veraison, and despite welcoming increased yields after the well below average crops of the past two vintages, a number of producers decided to thin their heavier cropped areas. The slow ripening conditions continued, and even with warmer conditions in February, it became apparent the start of vintage would be approximately two weeks later than normal, in mid March. The warm weather continued through March with two rain episodes, of 20mm each, at the beginning and the end of the month, causing minor disruption to harvest, but also boosting soil moisture after a particularly dry summer and early autumn. Wind and sun immediately following both rainfalls ensured rapid drying of the vines and minimised any disease pressure. Mild weather continued through April and May, with no significant precipitation until the 17th May, by which time the majority of fruit had been harvested. There were a number of isolated outbreaks of botrytis in some thinner-skinned varieties reported, however the vast majority of fruit was clean and disease free. Post vintage assessments have been encouraging with early reports identifying rich, ripe fruit flavours and good structure in the red wines, and attractive fruit and acid balance in the white wines. Despite some challenging weather and below average yields, the 2003 vintage can be described as very pleasing. During the winter of 2002, Coonawarra had below average rainfall, however the rain that did fall, fell in late winter so that the soil moisture levels at the start of the growing season were at or above previous seasons, ensuring good soil moisture levels for the spring growing period. These conditions brought about a good, even and slightly early budburst in early to mid September. Consistent weather patterns continued right through spring with warm days, average rainfall and no frost damage reported. As a consequence no disease problems were experienced. December and January were warm to hot and dry, however there were two significant rain events. The first of these occurred on New Years with 30mm of rain recorded, with another 30mm rain falling at the end of January. Fortunately on both occasions the rain was followed by warm drying weather and therefore caused no problems. The weather turned milder during February with lower than average temperatures. In late February 35mm of rain fell over three days (19th – 21st) and as a result there was a small amount of berry splitting (estimated at around 5%, with Chardonnay, Riesling and Shiraz being most affected). Vintage commenced with the harvest of grapes for sparkling wine base in late February and the harvest of white grape varieties for still wine, in early March. On March 19th 48mm of rain fell in just over five hours, with some reports of localised minor hail damage. This caused a brief flurry of activity as winemakers picked any damaged fruit. Following this was a temporary lull in harvesting as winemakers waited for the sugar levels to rise. Subsequent to this rain the weather was near perfect, with warm and sunny days continuing through to the completion of harvest. These ideal conditions resulted in fruit reaching its full maturity. The 2003 Coonawarra harvest was completed in early May with yields approximately 25 % below average across all varieties. This reduction in yield has been attributed to low bud fruitfulness from the previous season rather than the weather conditions. The Coonawarra Vignerons are pleased to report that the 2003 white wines are showing excellent varietal definition and flavour, and the red wines are very well balanced and showing good varietal characters, with Shiraz and Cabernet Sauvignon looking particularly strong. The 2002 Coonawarra Vintage can be summarised as very good, very little and very late. The record coolness of spring and summer (more than 20/degC cooler than average), delayed flowering and significantly reduced ‘fruit-set’. The low yields resulted from fewer and smaller berries per bunch, rather than a reduction in bunch numbers. Autumn temperatures were above average (1.8/degC above average for April) with clear conditions holding, providing plenty of bright sunshine and little rain. Harvest drew to a close 1-2 weeks later than usual, with the last grapes harvested on the 16th May. Low yields and ideal ripening conditions are normal precursors for high quality and the wines produced this year are of exceptional quality. The smaller berries and looser bunches allowed the fruit to mature to a high baumé and peak flavour ripeness, while maintaining ideal pH and crisp acid. Yields from the white varieties were less affected than the red varieties, with Chardonnay and Sauvignon Blanc looking good. The conditions were especially conducive to the crisp acidity of Riesling. The red wines are showing deep rich colour and excellent varietal definition, both on nose and palate. Cabernet Sauvignon, Shiraz and Merlot wines are all showing potential to produce some superb wines, albeit in limited quantities. The Coonawarra Vintage harvest has drawn to a close, slightly later than usual, with the last grapes harvested in mid May. 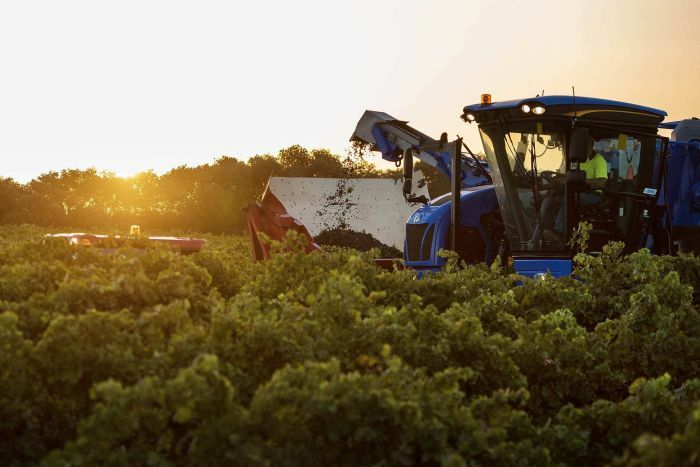 Fortunately we were relieved that this harvest did not see a repeat of last year’s low yields, as the Coonawarra Grape Crush is expected to have been in excess of 40,000 tonnes. This would make it the largest vintage on record, resulting from above average crops and significant new vineyard expansion coming into bearing, and contributing to a record crush industry wide. After the rains in March the weather turned for the better, allowing us to relax through fine sunny periods as the disease risk diminished. The season had commenced with a good fruit set, after which a summer heat wave created some worry with severe leaf stress affecting photosynthesis. January’s mean maximum temperatures were 3% above average and there were eight days above 38c in the month alone. The weather turned mild again, and despite the March rains, quality was good resulting in excellent color with bold, ripe tannin structures and varietal definition. High sugar levels were a feature of the earlier ripening vineyards, while some younger and higher yielding blocks ripened slowly as they struggled to reach the desired grape ripeness levels. After breathing a sigh of relief that Vintage for the Grapegrower is over, while the winemaker continues to finish off the wines, the grapevines have to be pruned for next year’s production as the cycle continues. The 2000 vintage was the earliest on record for Coonawarra with sparkling bases being picked in mid-February.Yields were down variously, ranging from 20% to 30% and 50% in older cabernet sauvignon vines. The vintage on the whole saw yields well down on the average. There were a range of contributing reasons for the decrease in yield including: a severe frost in late April 1999, an early budburst due to warmer than average maximum temperatures in the June to October period, below average temperatures in November impacting on flowering, low bunch numbers and frost in the spring. The weather during vintage was clear and dry from February through to May and indeed the March-April period saw the slowest ripening for years. The rain that did fall during vintage was invariably accompanied by or followed by winds that helped prevent moisture under canopies becoming a problem. The weather conditions reduced considerably the threat of disease in Coonawarra in the 1999/2000 growing, maturing and harvest periods. The below average temperatures early and late in the season, high January and February temperatures, below average rainfall in the ripening and vintage periods helped reduced the pressure from disease threat. In terms of effect of weather on the quality of the grapes the long, cool ripening period has provided excellent conditions for flavour and colour enhancement. The 2000 reds have produced some excellent flavours and colours that have many winemakers quietly excited about the potential of the wines they have in the wood. They had intense colour and flavour on the vine and in the juice due to the small berry size and low bunch numbers, wonderful pH and acid balance. There is an expectation for slightly higher than average alcohol due the marvellous ripening conditions experienced for the third year in a row. The whites from 2000 have shown excellent varietal definition with great flavour and good acid balance. The expectation is that the whites will provide average to above average quality wines. The 2000 Vintage was the earliest ever vintage in Coonawarra where the lower than average yields have been compensated by outstanding fruit quality. It is worth noting that an early vintage in Coonawarra has generally resulted in exceptional wines. 2000 is a year to watch for Coonawarra success.